For all students who wish to understand current economic and business literature, knowledge of mathematical methods has become a prerequisite. Clear and concise, with precise definitions and theorems, Werner and Sotskov cover all the major topics required to gain a firm grounding in this subject including sequences, series, applications in finance, functions, differentiations, differentials and difference equations, optimizations with and without constraints, integrations and much more. 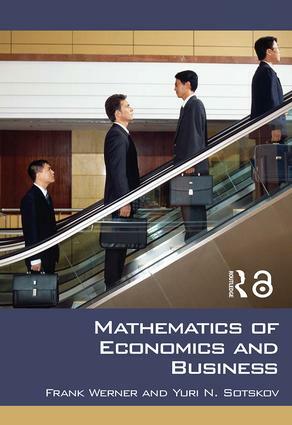 Containing exercises and worked examples, precise definitions and theorems as well as economic applications, this book provides the reader with a comprehensive understanding of the mathematical models and tools used in both economics and business.